H.H. Dalai-lama’s explanations always emphasize that the text is meant for meditation and everyday practice. To say that the text is meant for use in meditation means that the whole or selected parts are to be read or recited from memory each day, aloud or silently, and reflected upon. (1) Respectfully, I prostrate to the Blissfully Gone (Buddhas) endowed with Dharmakāya, as well as to their (Bodhisattva) offspring and to everyone worthy of prostration. Let me explain (how to) engage in the Blissfully Gone offsprings' code, which I’ve compiled and condensed in accord with Buddhas’ words. (4) Having gained this (body with) respites and enrichments, so hard to find, which can fulfil the wishes of (every) being, if, in this (lifetime), I don’t actualize its benefits, when later will a perfect endowment with one come? (6) Thus, constructive (behaviour) is constantly weak, while negative forces are extremely strong, and most unbearable. Except for a full Bodhichitta aim, can anything else constructive outshine it? (9) The moment miserable beings bound in the prison of uncontrollably recurring Saṁsāra develop a Bodhichitta aim, they’re called spiritual offspring of the Blissfully Gone, and become figures to be honoured by the gods of this world, as well as by men. - a Bodhichitta that’s engaged with (attaining) enlightenment. 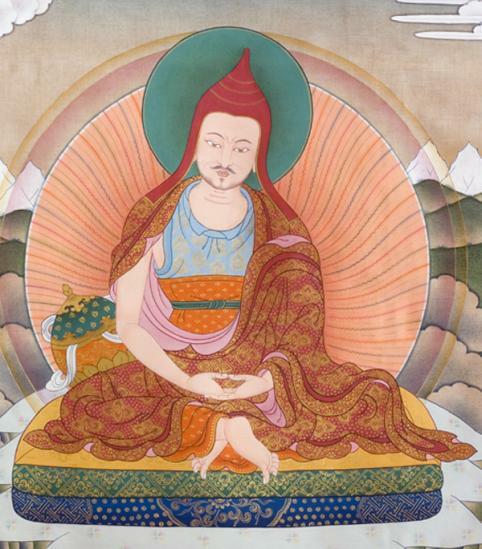 (17) Although great fruits arise, even in recurring Saṁsāra, from an aspiring Bodhichitta aim, positive force doesn’t accrue without interruption as it does with an engaged Bodhichitta aim. (20) For the sake of limited beings admiring modest (aims), the Thusly Gone (Buddha) himself has proclaimed that this is correct in The Sūtra Subāhu Requested. (23) Who has such an altruistic mind as this? Do even fathers? Do even mothers? Do even gods and sages? Does even Brahma have it? (32) People honour as someone who acts constructively someone who only briefly gives merely a morsel of meagre food in a demeaning manner to a few wandering beings, satiating them for half a day.